This mighty little off-roader will have better electric range than many competitors without sacrificing off-road capability. Video | What's New With the 2019 Jeep Renegade? The 2019 Jeep Renegade features a number of noteworthy changes. This video explains the styling, features and engines that changed. The 2019 Jeep Renegade gets key updates, specifically a new turbocharged engine that corrects one of this subcompact SUV's major flaws. 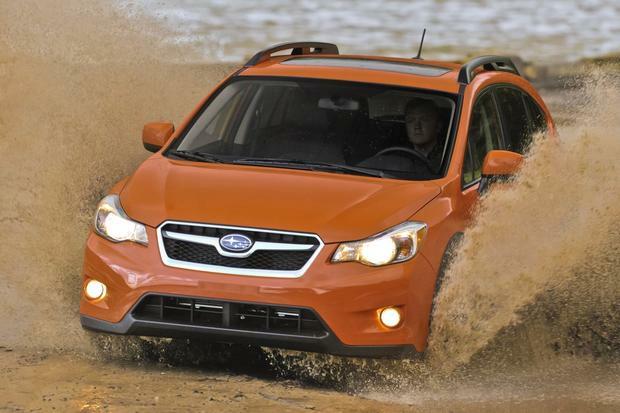 2016 Jeep Renegade vs. 2016 Subaru Crosstrek: Which Is Better? The 2016 Jeep Renegade and 2016 Subaru Crosstrek are great small-SUV choices for those who venture outdoors. But which is better? Thanks to renewed consumer interest in off-road vehicles and the brand's wide array of compelling products, Jeep is on a hot streak as of late. While the company has a ton of great new products and more on the way, there are also a variety of compelling used Jeeps available as well. Here we'll discuss several that we think would make a great purchase for anyone with a budget of around $20,000. There's one vehicle that comes to mind when you hear the word Jeep, so we'll cut right to the chase: Buyers looking for a used Jeep Wrangler for around $20,000 should target a 2012 to 2017 model. While the "JK" Wrangler was introduced for the 2007 model year and offered through 2018, a number of updates over the years make certain variations more appealing than others. The JK Wrangler received an all-new interior design for 2011, which helped to make it much more livable than in prior model years. A year later for the 2012 model year, the Wrangler gained Chrysler's ubiquitous 3.6-liter "Pentastar" V6, an engine offering a good balance of power to fuel economy and used throughout the Chrysler, Jeep, Dodge and Ram lineups to this day. For these reasons, we recommend prioritizing a 2012-or-newer model in your search for a $20,000 Wrangler. Luckily for buyers, there are more than 1,000 listed on Autotrader that fit the bill. Another thing to consider is trim level. Buyers looking for a Wrangler for on-road use might find a Sahara to their liking, as the Wranlger Sahara offers niceties like a leather interior, heated seats, nicer looking wheels and a body-colored hard top. Anyone wanting to go off-road should look to the Wrangler's Rubicon trim, which offers tons of off-road features like locking front and rear differentials, a disconnecting front sway bar, off-road shock absorbers and taller fenders ready to accept oversized tires. Of the 1,000 plus 2012-2017 Wranglers currently listed on Autotrader for under $20,000, around 200 are Sahara models, and fewer than 50 are Rubicons.